Since its inclusion on the Olympic programme in 1964, judo has become so much part of the international sports programme that it is only too easy to forget that it had its origins in a very different tradition – the honoured Japanese tradition of Do or The Way. When Jigoro Kano reformulated his system from its ju-jitsu forbears, he took great care in deciding upon a name. His choice of Judo – The Gentle (or Yielding) Way – signified, for Kano and his contemporaries, the nature of the activity itself. The Ways have a long history in Japan, though they were particularly developed during the Edo period – from the 16th century The concept was simple yet profound: through the rigorous and lively practice of an art, a mature character could emerge. The actual form or art was not so important – the very variety in Japanese culture reflects the range of human interest and human nature. Among them are bushido (the way of the warrior), chado (the way of tea), kyudo (the way of the bow), shodo (the way of the brush) and kendo (the way of the sword). Judo is part of this tradition. However, Trevor Leggett mentions that judo is a difficult Way to follow because it is so complex technically and it is only too easy to become enmeshed in the pure mechanics of it all. On the other hand, it can be an effective medium of changing and developing the personality because it does not involve any external tool – there is no brush, no spear, no bowl of tea, or bow. There is just us. In this invigorating collection, Leggett gives memorable pointers to the use of judo as a Way. There is always a danger with fashionable Zen stories that they become mere diverting entertainments. 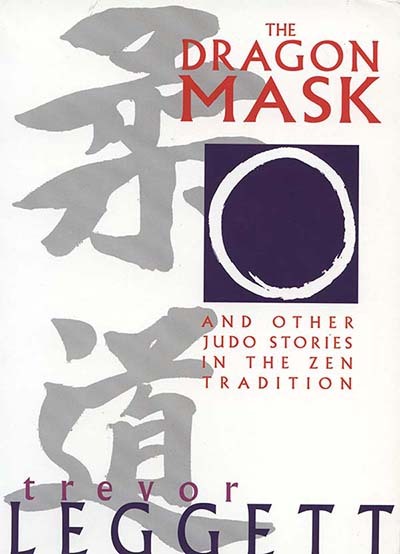 But the 10 / The Drag on Mask merit of The Dragon Mask and other judo stories in the Zen tradition is that no one who has met Trevor Leggett, or had the benefit of studying under him, can doubt that these stories come from the heart – and that they have been put into practice before finding their way onto the page. Judo and the Ways , The Dragon Mask I , Introduction , The Dragon Mask II , Efficiency of the Heart , Onshi , Outer and Inner Balance , Tricks , Judo and Calligraphy , Manners , The Cherry Tree, The Killer Instinct , Question , A lovely style , Cutting off the bull’s horns , Specialization , Help , Tigers and Rabbits , Limits of Technique , Specialities , Humble , Predicting the Result , Dr. Kano’s washing , New Black Belt , Ingenuity , Inspiration , The tradition of Judo , Kangeiko , Judo koan , Disadvantages , Beginners , The learning process , Kind-hearted , Surprise , Hard and soft, Falling , Irrelevancies , Faith , Ippon-yari , Endurance , Run-up , Quick , Sacrifices , Even effort , Special duties , Hold , Excuses. The author of this book, and translator of the original text, is an Orientalist and a scholar of Japanese. He makes an interesting point in his Introduction when he says: Philosophy alone is sterile: yoga alone is a frightening tangle’. …In the first part of the book, the Chapter of the Self text, dated about 500 BC, and the 700 AD commentary on it, are given with notes on authenticity and so on. In the second part, he brings together the Shankara commentary and the same sage’s exposition of the Yoga of the Self, thus avoiding the difficulties. To sum up, this is an excellent and enjoyable book, geared to the needs of the Western world and to the serious student of the Path.